Selectel and Page Plus dealer Genius Wireless is running a new promotion good through the end of November. It gives new customers who port or activate a new cell phone number on the Selectel $30, $40 0r $55 plan 50% off their first month of service. Click here to initiate a new Selectel activation or port request and get 50% off the price of your first month of service. $30/month - 1300 minutes, 3000 texts, 500 MB data. Overage data is 5¢/MB on all plans, overage minutes and texts are 5¢ each on the $30 plan. Selectel service uses the Verizon network. All Selectel plans include no-extra cost off-network voice and network roaming. Selectel service is currently 3G only, with LTE expected to be available soon. Selectel can activate any clean-ESN, non-LTE Verizon phone except for ones sold for use on Verizon prepaid. Most Verizon LTE phones can also be activated on Selectel but require complex manual programming (aka "Flashing") to get them working. Sprint, U.S. Cellular and othe non-Verizon phones can't activated on Selectel. Compatible phones are available from Genius Wireless or you can bring your own. Genius Wireless is also offering 50% off the first month of service when you activate a new line of service on the $50 MiFi AutoPay plan which includes 5 GB of data and works with any Verizon 3G hostspot. To get the discount just order the $50 MiFi AutoPay Plan and enter the discount Code 50 in the Coupon Code field. Genius Wireless is also running yet another November promotion for current Page Plus and Selectel customers. Use the discount code THANKFUL55 to get 5% off the Selectel $55 Data User monthly plan or the $55 The 55 plan from Page Plus. For more about Selectel see PrepaidPhoneNews' Selectel Operator Profile. 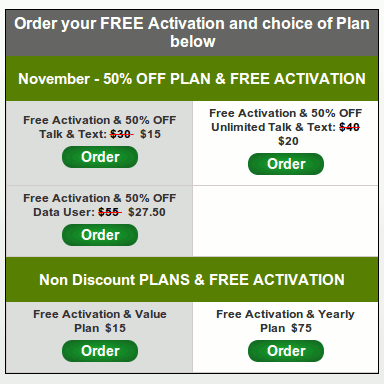 I do believe the $30 Selectel plan is 1,300 voice minutes and 3,000 text messages, not 300 and 300 as written above. You are correct, I've updated the post. Thanks for letting me know. Are you aware if one can use a new, never activated phone/device, such as the 3G LG Optimus Fuel sold through StraightTalk and Tracfone and activate it on Selectel, or has Selectel implemented the block of non-Selectel phones/devices? With this attempt to promote Selectel plans coming on the heels of Kitty's attempts to get more directly into the MVNO business for herself, why do I get the sense that some Page Plus dealers are now trying to distance themselves from Page Plus? Sounds like the dealer concessions dried up under Carlos Slim and there's not much profit to be had re-reselling VZW.